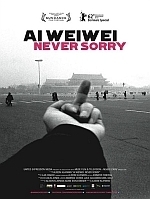 The recipient of a timely cinematic release courtesy of Artificial Eye, four years on from the 2008 Beijing Olympics, Alison Klayman’s extensive documentary Ai Weiwei: Never Sorry (2012) leaves almost no stone unturned in its quest to capture this most outspoken of Chinese artists. Hounded by the ruling government after his denouncement of the 2008 Games as pure “party propaganda”, Ai Weiwei has since become the country’s answer to Andy Warhol, with a growing army of followers cultivated through his use of social media. Beginning in his secure Beijing studio, where he muses on one of his cat’s ability to open doors, yet never close them (unlike human beings), Weiwei comes across as a mercurial mischief-maker – albeit one with an astute socio-political conscience. Having overtly criticised his nation’s 2008 Olympic campaign (despite designing the iconic Bird’s Nest stadium) and the government’s reaction to the catastrophic Sichuan earthquake that same year, Weiwei switched his focus to exhibitions across Europe. The most famous of these came in 2011, with London’s Tate Modern commissioning the artist to fill its enormous Turbine Hall. Pacing through a sea of porcelain sunflower seeds with his young sun (the mother of who is not his wife – which is made patently clear throughout), Weiwei is at his most serene and contemplative. Yet his phone remains clasped in his hand. If the pen was once mightier than the sword, it is now bloggers and Twitter that have become the 21st century weapons of choice for aspiring revolutionaries. The sheer material Klayman has to work with in Never Sorry is a testament to just how publicly Weiwei chooses to lead his life, capturing nearly every thought and moment either on video or in 140-character tweets. Thankfully, a sense of balance is not entirely absent from this Weiwei love-in. He appears remarkably cold and stand-offish towards his seemingly supportive mother. As she breaks down in tears on camera at the thought of her son coming to harm for his beliefs, Weiwei matter-of-factly points out: “If they want to get me, they’ll get me”. His caginess towards his apparent past infidelity also displays a human side to the man, dismissing his son’s mother as a mere “friend”. Whether this is, in itself, an ironic form of self-censorship or merely a father upholding the right of privacy for his family is delectably debatable. Easily one of the finest documentaries to have been released this year (in what has been a relatively strong 2012 for factual filmmaking), Klayman’s Ai Weiwei: Never Sorry is both a perfect introduction to an endlessly intriguing individual, and a unveiling of sorts for fans who know the artist solely through the online arena.